Pay only P 14,124 a Month for 12 months. Or pay only P 26,750 a Month for 6 months. 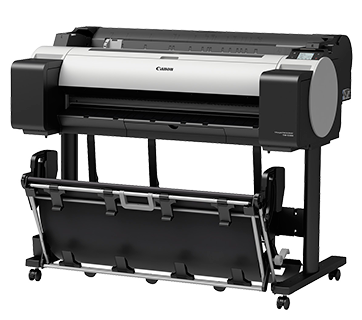 The TM-5300 allows you to enjoy high-speed, accurate printing complete with vivid colours, high security, ease of use, all in silence. The TM series boasts Canon’s LUCIA TD inks. This 5-colour fully pigment inks, with high surface tension, produces lines and text that are dense and crisp with minimal feathering. Vibrant colours can also be produced from LUCIA TD ink which enables users to economically print high quality drawings and posters on inexpensive uncoated plain paper. TM series offers a wider range of user applications and opens up new markets. For example, customers can expect superb vibrancy, print quality and longevity in outdoor displays when used with Canon’s water resistant media. During operation the imagePROGRAF TM Series boasts a quiet acoustic sound level of only 44dB; thus enabling it to even fit in smaller office environment without a fuss. A compact and integrated design, with full front usability, means little installation space. The new imagePROGRAF TM Series include a variety of software designed to bring out all of the full potential in your printer. 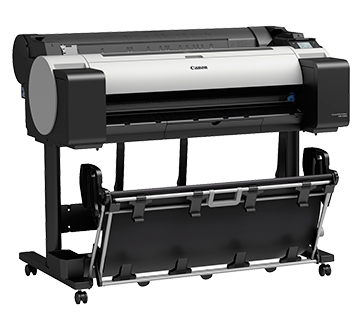 With an abundance of software included, the imagePROGRAF TM Series is equipped with everything needed to print technical documents, maps, posters, banners, signage, infographics, designs, and more. 515mm(JIS B2),728mm(JIS B1),594mm(ISO A1),841mm(ISO A0),10",14",17",24",36"